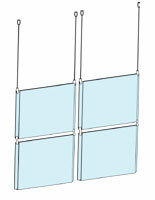 SignSupplies2Go.com sells steel cable hanging systems for in-store window displays. These suspended signs have a distinctive look that gets noticed by passersby. Why is a cable hanging system such a good advertising aid? They are sign kits that can be used virtually anywhere! 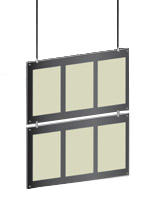 These cable hanging systems, also known as suspension picture displays, are often seen dressing up the windows in retail stores. Versatility is the game with these suspension signs. These cable hanging systems may be displayed as a single panel presenting a one or two-sided message. Or, they may be displayed in a numerous-panel matrix. The cable hanging systems with your custom graphic really get the attention of on-lookers. There is no better way to entice someone into your business than with an impressive window display. These steel cable hanging systems for sale are the attention grabbing advertising signage you have been looking for! What makes a cable hanging system so good? 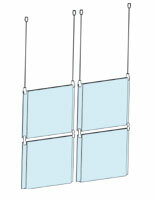 Suspension signage may be used as one or two-sided display holders. They are often used as window displays because they can be suspended from the ceiling. 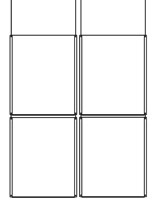 This allows for versatility in placement, which ensures they mesh with other window decorations and mannequin displays. As they are two-sided, if your windows are easily visible from both inside the store and out, customers will not see blank signage but additional artwork that will enhance the décor of your showroom. These picture displays allow for the incorporation of printed graphics and artwork in a window display. Imagine your mannequins dressed in your spring line with additional photographs displaying how to coordinate the displayed items with even more pieces in the collection! The looks displayed are sure to peak the interest of many customers who will try on the outfits highlighted in your window display. The suspension picture signs work anyplace in a room! No need to use these exhibit pieces solely as window dressing. These holders may be placed near a wall or even in the center of the room! They are a great mechanism by which store policies may be highlighted, especially during peak holiday shopping days. They may also be used to display decorative posters to celebrate the holidays or just send best wishes to your customers. A well-placed suspended sign above an exit can tell shoppers how much you appreciate their business. Is the cable hanging system only good for retail associations? Certainly not!!! Suspension signs may be used in any location. There is no better way to highlight homes for sale in a real estate office than with these matrix signs. Choose your top listings to promote them even when your office is closed! Even nail and hair salons will benefit when they use these window signs. Create a montage of hairstyles and nail art to entice customers into your doors and increase business! Architects are able to showcase building designs with these impressive window systems. Virtually every business that provides professional services to customers will attract more attention when they display their creations or services with a window sign matrix. These picture matrixes are not just for retail and service. They may be used by any community organization to promote upcoming events, showcase special happenings in the community, or highlight the volunteers of the month. These sign kits may even be suspended in a hallway or within a large room to provide directions to customers, patrons, and guests. Where are the restrooms? Where is the main art exhibit? In what room is the community meeting? Let a suspension holder lead the way! As these holders use custom graphics, you don't have to spend a lot of money making a professional looking sign that will be noticed. Just use your computer printer to create the signs you need. This is especially important if you change your messages often. There are so many uses for these great matrix signs. The acrylic displays are available in a number of configurations. Purchase a single holder or choose a set with up to four holders across and down! The best part, if you choose a 16-piece sign system, you don't have to use all 16 pieces all the time! You are even able to separate these pieces and use them in numerous places throughout your showroom. That versatility isn't possible with many sign systems. If you don't think that you need a full 16-piece window display, you can continually purchase a smaller matrix system today and buy accessories to expand it at another time! These acrylic sign systems are some of the most versatile, eye-catching models we sell! Check them out now and be sure to see our best sellers if you're not sure what you want!